Haggerstone Island is a unique privately owned guest house catering for up to ten guests. Situated at the remote northern end of the Great Barrier Reef, it is adjacent to the uninhabited Cape York coast line. Guests choose their daily adventure from fishing, snorkelling, exploring uninhabited islands and mainland beach, bays and rivers. All daily excursions involve the catching of seafood for lunch and the evening meal. Lunch is prepared gourmet style on board their 11 metre jet boat. Children are welcome. The island is regularly booked as a whole providing a unique group or family holiday. House Mawu – The brand new House Mawu is a three bedroom fully self-contained home. House Mawu was designed exclusively by Roy and is, without doubt, his best yet. The house is located on the hillside overlooking the big lagoon. With an open plan, thatched roofs and starlit bathrooms, it is the ultimate designer’s dream of island seclusion. The Main Pavilion – where all meals are enjoyed at a large communal table or around the open fire. There is also a library, comfortable couches and daybed, bar, open kitchen and two bathrooms. Communication systems, medical, phone, fax and stores are located here. The Lagoon Hut – situated on the big lagoon and comfortably sleeps 2 adults or a family of 4. 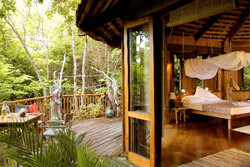 This hut is a timber round house and features an expansive deck with dramatic views overlooking the big lagoon. The Kwila Hut – an open plan, hand crafted timber dwelling, nestled near the water, set under the canopy of Coral trees with decks looking toward the reef this hut comfortably sleeps 2 adults or a family of 4. Handcrafted from New Guinea Kwila timber this round house contains an interesting collection of New Guinea artifacts. The Beach Hut – the most secluded and rustic hut constructed largely of driftwood with large shutters which can be opened out to embrace the wilderness. This hut is set directly on the beach and sleeps 2 adults or a family of 3. A separate completely private shower and toilet are located under the coconut palms. Jetty – a gorgeous place to sit, relax and watch the schools of fish, the jetty has a thatched roof and a cooking fire and overlooks the big lagoon. Discover some of the other accommodation nearby in Haggerstone Island.